While there are other types of Nancy Drew books out there (Files, Notebooks, Clue Crew, On Campus, River Heights, Girl Detective, Supermysteries with Hardy Boys), I am going to focus on the original Nancy Drew Mystery stories. I have tried reading the original versions from the 1930s, but I just could not get into the language. Therefore this challenge will be spotlighting the revised Yellow Spined hardback books that were reprinted and are universally recognized when you think Nancy Drew. The books for this challenge will be 1-56 (The Secret of the Old Clock to The Thirteenth Pearl). I realize that 56 books sound like a lot, but Nancy Drew books are really quick reads...and there are pictures! What are the dates for the challenge? The dates for the challenge are January 1, 2010 to December 31, 2010. Are audiobooks and ebooks allowed? Can I read any version of Nancy Drew books? For this challenge, only the yellow hardback versions will be counted. What if I've already read some of the books? Do I have to reread? Can I skip those? Re-reads can count. If you've already read some and want to skip to those you haven't read, that is allowed as well. The goal is to be able to say you've read ALL the books. Is there an age restriction for this challenge? Nope! Anyone any age can join! Whether you've been reading Nancy Drew for years or are just starting to discover the books. These books can be used as crossovers in other challenges. Will there be prizes for the challenge? YES, there will be chances to win prizes! Click here to read about it. Please sign up in the Mr. Linky below with your post for the challenge. Please link directly to your post page and NOT your main blog page. This is so cool. I love reading Nancy Drew. I even use them as spacers when I feeling bored after reading my ultra heavy textbooks. I bet that will be fun. What a great nostalgic challenge! I remember saving up my allowance and going to the local department store every month to buy a new yellow-jacket Nancy Drew. This is going to be fun!! I'm in. Quick question...I am ordering my books from the library...do you have any idea about the time frame the yellow books were published?? Will use Mr. Linky to link to my blog post. This is a great idea for a challenge, I loved Nancy Drew growing up! Thanks for hosting. I just turned 15, and have read the entire series twice, as well as most of the New Nancy Drew series, a few of the Nancy Drew Files, and a few original Nancy Drew's from 1930-1934, which I have been able to acquire through Ebay and a local used bookstore. This is an excellent idea for a challenge, and I'd recommend it to anyone. I read a lot of these books when I was younger, but now have forgotten what they were about. This is a great way for me to become reacquainted with them. I can't wait to start! I'm going to try! Hopefully I can do it! Wow! I'm not sure I can take this challenge next year, as I've already committed to another one. But I loved Nancy Drew. I read all 56 of them as a kid. Except for a few pieces that somebody "borrowed forever," I have the complete set. My mom took every occasion as an excuse to gift me some books to complete the set. They were my most valued possessions, and I slept some sleepless hours worrying how I could save them all in case of a fire. I wonder how it would be like reading this as an adult. I was planning on doing this myself this year and then Jennifer (5 Minutes for Books) pointed me in your direction. I'd love to participate in your challenge and see how far I get. Oh, what fun!! I have the first 20 or so of the yellow-spine Nancy Drews in my basement (from when I was little), so I'll start there. :) I'll get my post up closer to January. Thanks for this challenge! No post yet but I want to join in! I'll post closer to the New Year. What fun! I am joining this challenge. I still love Nancy Drew. She was my favorite growing up. I still have most of the 56 books. Not sure I am going to be joining in - because 56 books might just kill me - but I just wanted to tell you this is an AWESOME challenge! I loved the Nancy Drew books growing up and I am glad to see people are still big fans! Hi. I'm posting a book reading challenge myself. I hope you don't mind that I steal some of your ideas, like using Mr. Linky and having an FAQ. I'm going to give it a shot!!!! I don't know if I can do all 56 but I figure your challenge might be the thing I need! Ooooooh - I'm up for this! I LOVED Nancy Drew as a child, and have been looking for something to read this year. What better way to pamper myself than to disapper into the world of my fav Mystery Solver! Thanks for the challenge - can't wait to get my hands on my first book! I'd like to sign up, please. I am in! I have wanted to read them too. What a great way to do it. OK...I have to do this one! I loved these as a kid and would welcome the challenge to revisit them! If I can find the yellow-spined ones in the library, I'll sign up too. I don't think I can read the whole series. We just had our local library pull these out of the archives for my daughter. I'll have to see if she'd like to join the challenge. My part of the challenge will be to track down the three books of the set that the library was missing! I have read them all already! I would love to do this! I have all of the Yellow hardbacks. I read quite a few last Summer, but I don't mind re-reading them. They are quick reads. 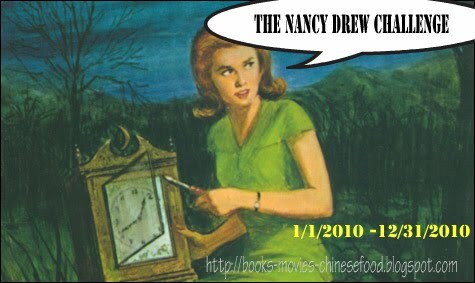 I love the Nancy Drew!!!! I'd love to read/re-read these books! Quick question... How do we show our progress? This is a brilliant idea! I am signing up. Just signed up. I've only read one book, but I have played about 15 of the the pc games! I'm so excited! I LOVE Nancy Drew! I am really excited about this challenge and I was just thinking about reading this series. I read some of them when I was younger, but never did read the whole series. Finally, getting around to signing my girls and I up for this. Thinking we will start where we left off, and then go back to the beginning. My girls are so excited! I like. I went through almost all of them in grade school, but I never did find a copy of the Thirteenth Pearl. It's ON. Is it too late to join in the fun? One of my daughters and I want to participate but the Linky isn't showing up to sign up. to those who tried to sign up but couldn't bc mr linky was down, it's back up and you should be able to sign up again! This is fun...don't know if there is a time limit on signing up, but I wanted to link you to my post anyway. Although I was late I wanted you to know that I started! 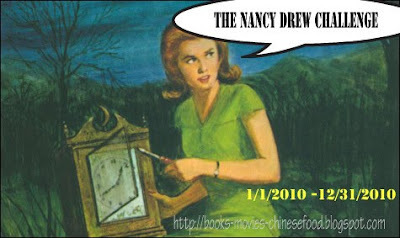 My post is here http://praiseworthythings.blogspot.com/2010/02/nancy-drew-revisited.html After I was finished I laid the book on the coffee table and my 11 year old daughter picked it up and read it too. Thanks for the challenge! Just found this challenge and am jumping in. I got started last night. And it's a good excuse to start buying them for my little girl! I signed up a while ago and my name is still up. I'm Ryan, but my comment has disappeared! I just found this challenge through the Reading to Know blog and am so thrilled. I loved these books as a child and have wanted to read them again. Now I have an excuse. I am hoping to get my 13 year old daughter interested in them as well. As soon as I get a post up I will link to it. Hope it is not too late to sign up! I am proud to state that, as of 12:30 am this morning, I completed the challenge! From the Secret of the Old Clock to The Thirteenth Pearl, I have followed Nancy through every one of her original mysteries. Thank you for this challenge-it was a blast! I love Nancy Drew books...this will be fun. Oh, my goodness -- count me in, as I've made this my challenge for this year totally independently, and came across this post by sheer dumb luck! I'm so sad I missed out on this challenge! I have loved Nancy Drew since childhood, but I couldn't possibly get through all 52 books before the end of the year with my schedule. I hope you'll do this challenge again next year!